SAN RAFAEL LAS FLORES, Guatemala (AP) — The neighbors of the San Rafael silver mine no longer come out of their homes for fear of the machine-gun toting troops and police who man checkpoints in these green, wooded mountains. The plaza in the town of San Rafael Las Flores, where the community used to mingle, is now deserted. The fear that rules this terrain, where residents are mostly Xinca Indians, recalls the bad old days of the country’s three-decade-long civil war, which killed as many as 200,000 people. But what’s brought in the troops this time are protests over plans by Vancouver-based Tahoe Resources Inc. to tap what the company says is one of the five largest silver deposits in the world. Protesters say the project, called El Escobal, will drain or pollute the local water supply, and hundreds of people have blocked roads and burned buildings to stop it from going forward. That’s tested President Otto Perez Molina, who sent in hundreds of troops and suspended the right to hold public gatherings in four townships near the mine in early May. It was the second time during his 16 months in office that he has declared a state of siege in response to protests against a foreign-run mining project. With violence rising, the mine protests have now emerged not only as a threat to Perez Molina’s young administration but also a warning to other foreign companies seeking to invest in the region. The residents of San Rafael, however, say they’re been left with no choice but to fight. They also accuse the government of favoring foreign investors over communities. The company and its supporters deny the town’s accusations, saying the mine will instead bring jobs and tens of millions of dollars to local governments and communities. 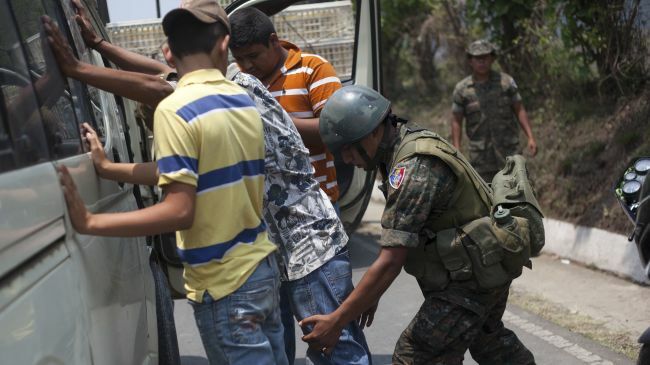 Claudia Samayoa, director of Guatemala’s Human Rights Defense Unit, said the political damage has already been done. “One interesting thing we have been finding in San Rafael Las Flores and the communities affected by the state of siege is that people who supported the president are telling us they no longer back him,” Samayoa said. A new poll by CID Gallup shows approval of Perez Molina’s presidency nationwide falling 20 percentage points over the past year, from 68 percent in May 2012 to 48 percent this May. The poll, which was conducted between May 2-9 and had a margin for error of 3 percentage points, cites street violence and a lack of jobs for the fall. Such conflicts are breaking out all over Latin America, where local resistance to foreign-driven mining projects have paralyzed whole regions and claimed dozens of casualties. At the same time, such projects have become ever more popular as world prices for copper, iron ore and other metals have boomed, driven in large part by growing demand from China. In Peru, such protests have presented a major challenge to President Ollanta Humala, while similar outrage over foreign exploitation of local resources helped defeat presidents in Bolivia. Activists say problems at the Guatemala mine began in 2007, when the owner at the time, Canada’s Goldcorp Inc., came to San Rafael with an exploration license. In 2010, the mine was sold to Tahoe Resources. “Since then the problems have aggravated,” said Oscar Morales, president of the Community Development Council, which serves as a link between locals and political authorities. He spoke with the AP from a secret location where he has been in hiding since authorities raided his and family members’ homes searching for arms. He said nothing turned up in the searches. Morales said eight community consultations of 4,222 adults found that nearly all of them opposed the mine. He said he wants to hold another legally binding community consultation about the mine, but municipal governments have refused. Yet the violence only grows more destructive the longer the dispute remains unresolved. On Sept. 17, 2012, mine workers transporting tubes for electrical cables on the main highway in the region were stopped and held by townspeople opposed to the mine. The following day, unknown attackers set fire to mine warehouses and a patrol car. About two months later, enraged townspeople burned a hotel and stole dynamite belonging to the mine when authorities blocked a community meeting about the project in the nearby town of Mataquescuintla. The deadliest clash occurred on Jan. 11, when a shootout between protesters and mine security guards left one farmer and two guards dead. Then, on March 17, unidentified gunmen abducted four members of the Xinca parliament in confusing circumstances. One ended up dead. Faced with the growing violence, the national government announced the creation of a mediation commission, and on April 3, the government granted a 25-year exploitation license to the San Rafael mine “after it fulfilled all the requisites set by law,” according to Davila. The mine has the necessary permits but is not yet operating. After another protest left a policeman dead and six locals wounded, Perez Molina declared a 30-day state of siege that banned public gatherings and other civil liberties in four townships around the mine in Jalapa and Santa Rosa states. Some 500 police officers and 2,000 soldiers were sent to the area. The president later lowered the alert to a state of prevention, saying troops could no longer detain or arrest people without justification. Tahoe Resources vigorously defends the San Rafael project, which it expects to start operating before the end of the year. It says it has reached out to 2,000 locals to explain the benefits the mine brings. Some people in the region laud the jobs it offers. “My father and my brother work in the mine. I have received a scholarship from the mine. I think it is bringing development to San Rafael,” said 17-year-old student Paola. Many, however, are skeptical. They say the mine has already transformed the region, if only with all the troops and checkpoints that remain.